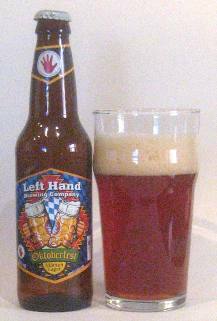 This morning I’m going to crack open a bottle of Left Hand Oktoberfest Mazen Lager. The label on the bottle says that it was bottles on August 30. It also notes that it is 6% alcohol by volume. Therefore I believe it was done little harm resting for a bit in my refrigerator. Appearance: The color of this beer is very reminiscent of the beers that I tasted of Oktoberfest in 1988. It is a deep red copper colored brew, almost orange. The head is composed of rather loosely knit large bubbles that form a very rocky surface. However, it appears to be a very effervescent beer. Aroma: The very first impression is a combination of caramel candy and lush green meadow grass. The second impression is similar to that of condensed malt syrup. There is very little hop influence. The third impression brings the return of some herbal aroma hiding behind the rich malt impression. Moment between lip and sip reveals a favor of neither flavor. Mouth feel: There is a medium mouth feel that is enhanced by a rather effervescent carbonation. There is a hint in the flavor that this might be a fairly alcoholic beer. Flavor: The first impression is almost a citric snap followed by the rich roasted flavors of the malt. The second sip echoes the flavors of the first, however, on aspiration, there remains a non-grapefruit citric sensation. This spike of flavor is not unpleasant. However, it is not quite to style for Oktoberfest beer. Finish: From the beginning of the finish all away through to the end there is an almost metallic flavor that sticks to the roof of the mouth. This flavor seems to be the result of the combination of hops used in this beer. It is palate cleansing without being astringent. Comments: In 1988 I had the opportunity to visit Munich for Oktoberfest. I’m glad to say that I had the chance to taste all six of the Oktoberfest beers that were served there. Each had a characteristic that made it unique however; all of them were of a similar style. As I remember it, and it was a bit of the haze, these beers were amber in color, rather light in alcohol content, and left a sweet finish on the palate. I have seen information posted that the style is changing in Munich. There is information available to say that this beer has become much more blonde, and higher in alcohol content. I look forward to trying to 2009 version!